Lok Sabha Elections 2019: "I will always stand with Priya and I will always stand by her side... If my sister will order me to fight the election, I will surely do," Sanjay Dutt said as he accompanied Priya Dutt to file her nomination in Mumbai Northwest. Priya Dutt was accompanied by Sanjay Dutt as she filed her nomination in Mumbai. Superstar Sanjay Dutt today accompanied his sister Priya Dutt as she filed her nomination for the national election. Ms Dutt is the Congress-National Congress Party candidate from Mumbai Northwest constituency. She will be fighting against the BJP's sitting parliamentarian Poonam Mahajan, who had defeated her by a margin of over 1.86 lakh votes in 2014 general election. The Dutt siblings flashed victory signs before the cameras as they reached the Bandra collector's office for Priya Dutt to submit her poll documents. Ms Dutt had visited the Siddhi Vinayak temple,a church and a dargah in the city before she went to file her nomination. "I am here because of my workers, this day is dedicated to them," she said. "I will always stand with Priya and I will always stand by her side... If my sister will order me to fight the election, I will surely do. I can't strategise the things, I think from heart and my sister is contesting elections after five years. I will do whatever she will want," Sanjay Dutt said. 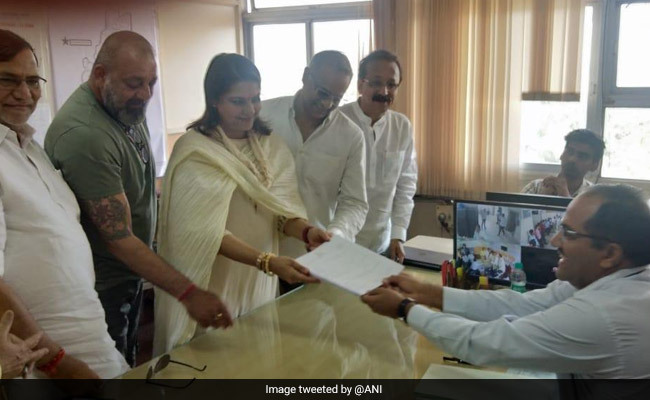 Lok Sabha Elections 2019: Priya Dutt filed her nomination from Mumbai Northwest. Sanjay Dutt was by her side. In January this year, Priya Dutt, a former lawmaker, declared that she was not going to contest but changed her mind later on the insistence of Congress president Rahul Gandhi. Earlier, there was a buzz that Sanjay Dutt himself may contest on a Samajwadi Party ticket but he denied the rumours last month with a tweet urging people to back his sister. The actor did have a brush with politics, when in 2009, he was set to contest the Lucknow parliamentary seat as a Samajwadi Party candidate. However, he had to withdraw his name after the Supreme Court refused to suspend his conviction under the Arms Act. The Dutt siblings, Priya, Sanjay and Namrata - children of late actor-turned-politician Sunil Dutt - have had their share of differences in the past. However, both the sisters stood by Sanjay Dutt when he battled drug addiction and later when he was convicted in the arms case related to the 1993 Bombay blasts. Maharashtra will vote in four phases starting Thursday for its 48 parliamentary constituencies. Counting of votes will take place on May 23. Mumbai Northwest is often referred to as the constituency of stars owing to the number of Bollywood celebrities residing there.